Spring is finally here, at least I’m hoping so. That was a long hard winter with lots of damage, dead plants, and lowered spirits. I can’t remember a winter that affected my overall mood as much as this one. Getting out in the garden, turning a blind eye to the plants that didn’t make it and instead concentrating on the ones that did helps to change my mood. And there were some surprises. I had picked last year to plant a number of conifers, trees and shrubs that aren’t supposed to be hardy for here and, surprisingly, most seem to have come through the winter fine. The best thing, by far, to bring me out of my winter funk is flowers. ‘Blue Zebra’ is a gorgeous new Primula that was introduced last year. The beautiful blue veining is the dominant colour, set off perfectly against the white petals and that bright golden eye just brings it all together and says “Smile. It’s over! Look how beautiful I am.” Last year, when I brought them in for Canada Blooms and the Peterborough Garden Show, we sold out and I didn’t remember to snag one for myself. I’ve already set three aside to help fill in some of the gaps that last winter made in my shade garden. At the Peterborough show this year, I was really happy to hear that they had come through the winter with no problems. Many Primulas are sold as annuals, but always with the caveat that they would probably come back. Saying it, though, and believing it are often a different story, especially with a brand new plant. 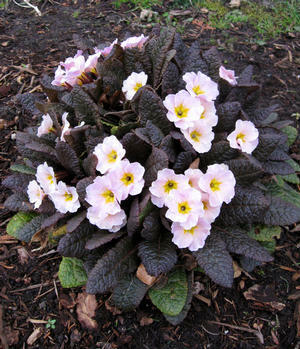 The Kennedy Series are a new group of hardy Primula vulgaris, with dark bronze to chocolate foliage. Pictured to the right is “Drumcliff” with light pink to white flowers that really stand out with the darker foliage. There’s also “Innisfree” with deep burgundy flowers, and “Claddagh” with apricot flowers. There will be more colours introduced in time and I, for one, can’t wait. I’ll be putting some under my “Shidava Gold” Japanese maple, so that the yellow stems stand out against the dark foliage. Rhododendrons are also a spring favourite of mine. They aren’t blooming yet, but now is the time when you get the best selection of colours. Not all rhodos are created equal. Some varieties are hardier than others and for those of us gardening a little further North, getting the right variety makes all the difference in the world. “Blitz” is a new variety for me. It has deep red flowers with large evergreen leaves on a more compact plant, getting to be about 3 feet tall in 10 years. It’s supposed to be hardy, but I usually take such claims with a grain of salt until I’ve actually tried it. Being more on the compact side will definitely help, as more of the plant will remain under the snow coverage. Like all rhodos, it needs an acidic soil. Even being in the middle of a pine forest, I’ll still put some soil acidifier in just to make sure. The picture above isn’t mine, so if it’s yours and you like it removed, let me know and I’ll take it down immediately . Now is also the time to be looking for Summer flowering bulbs, like Dahlias, Gladiolas, Cannas, and Callas to name a few. Last year, I planted one of each variety that I carried in the planters on my deck. Some had absolutely stunning flowers like “Lindsay Michelle” pictured above, but the ones that really stood out to me were the Gallery series. Pictured below is “Singer”. These shorter Dahlias, at about a foot tall, started blooming long before the others. By the time the taller varieties were blooming, the Gallery Dahlias were absolutely covered in blooms and they stayed covered in blooms for the rest of the summer. We’re doing something new this year. We’ll be having a featured item or items on sale every weekend, rather than a big sale on long weekends. All of the above will be on sale for our opening weekend, starting tomorrow, Friday May 2, and continuing through Sunday. I’m intending to blog about the weekend features every Thursday, but you might want to like our facebook page, www.facebook.com/johnsgardeninuxbridge, where I will definitely be listing what’s on sale every Thursday afternoon. This entry was posted in Plant Focus and tagged Blitz, Blue Zebra, Dahlia, Drumcliff, Gallery Series, Innisfree, Kennedy Series, Lindsay Michelle, Primula, Rhoodendron, Singer. Bookmark the permalink.